A small tribute to Ecuador and a big one to Quito. A like… Altitude. Quito lies at an altitude of 2,850m, making it the second highest capital of the world, La Paz being the first. B like… Bananas. The mini bananas, succulents, only costing a few cents per kilogram, are still fresh in my memory, almost ten years after the end of my Ecuadorian stay. Ecuador is the world’s leading banana exporter. C like… Chévere. “Chévere” is a commonly used expression in Ecuador and can be translated as “cool” or “awesome”. D like… Dance and Dense. As all around Latin America, dancing is popular in Quito. A dense city that dance, with its more than 6,000 inhabitants per square kilometre. E like… Ecuador. Both the name of the country, whose capital is Quito, and an imaginary line halfway between the poles of the Earth, a line whose path goes across Ecuador, a few kilometres north of Quito. F like… Fútbol. Ecuador took part in three FIFA World Cups (2002, 2006 and 2014). During the Ecuadorian championship, for matches shown on some Ecuadorian TV channels, it was possible, in 2005 at least, to sponsor thrown-ins and corner kicks. The commentator had to insert the name of a sponsor at every thrown-in and corner kick. A real challenge, especially for the frequent throw-ins. Local curiosity or Latin American speciality? 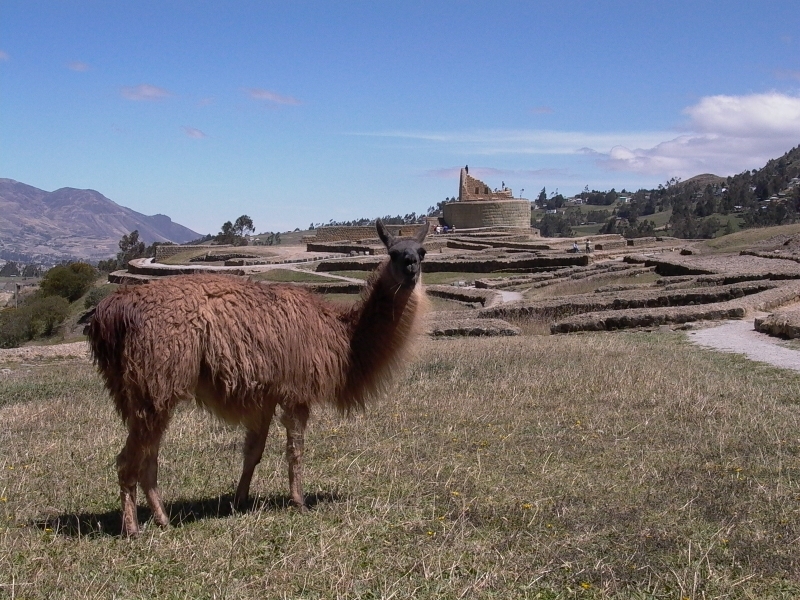 H like… Huayna Cápac, Inca emperor who annexed the Quito area and settled there. His son, Atahualpa, was born in Quito. I like… Ingapirca. On this site, some six hours drive south of Quito, a temple of the Sun was built by Huayna Cápac. J like… Jerusalem. With London and Krakow, Jerusalem is one of the three non-Hispanic and non-American twin cities of Quito. K like… Kichwa. A language spoken in Ecuador and southern Colombia, close to the Quechua language. L like… Liga de Quito. More precisely “Liga Deportiva Universitaria de Quito”, a sports team, mainly focused on football (soccer) – ten times Ecuadorian champions and first Ecuadorian team to win the prestigious Copa Libertadores (2008). M like… Mitad del Mundo. Literally “Middle of the World”. 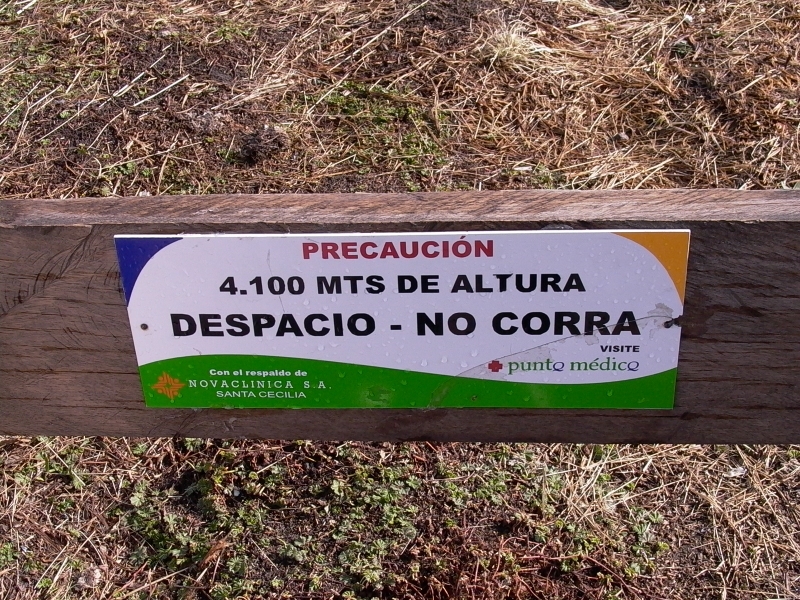 It is a monument, 26 kilometres north of Quito, which marks the passage of the line of the equator (latitude zero). N like… Neo-gothic. The Basílica del Voto Nacional is the largest neo-Gothic monument of America. 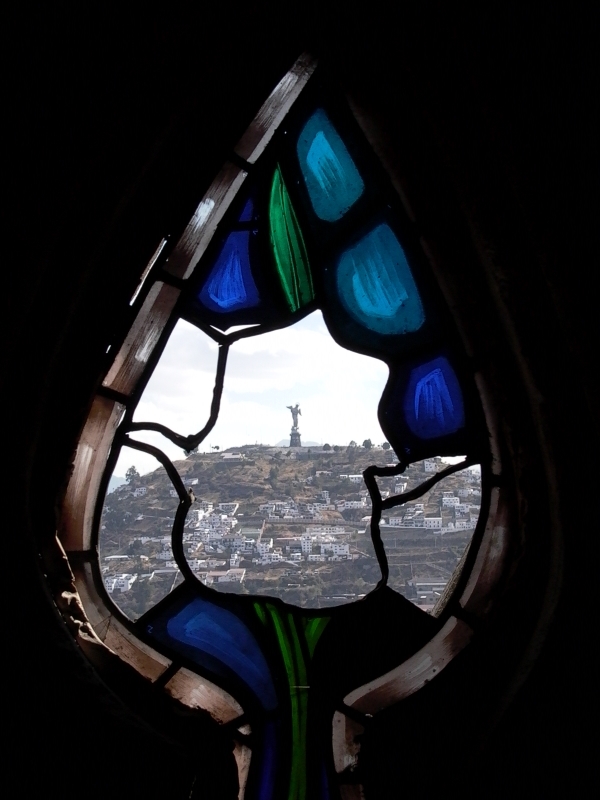 From the upper floor, the Panecillo and its Virgen can be spotted. O like… Otavalo. The city of San Luis de Otavalo, located just over 100 kilometres north of Quito, hosts one of the most famous South American markets. P like… Pichincha. The Guagua Pichincha (4794m), last eruption in 1999, dominates Quito. You can “climb” it on a gondola. Once up, beware of altitude! Q like… Quiteña/o. 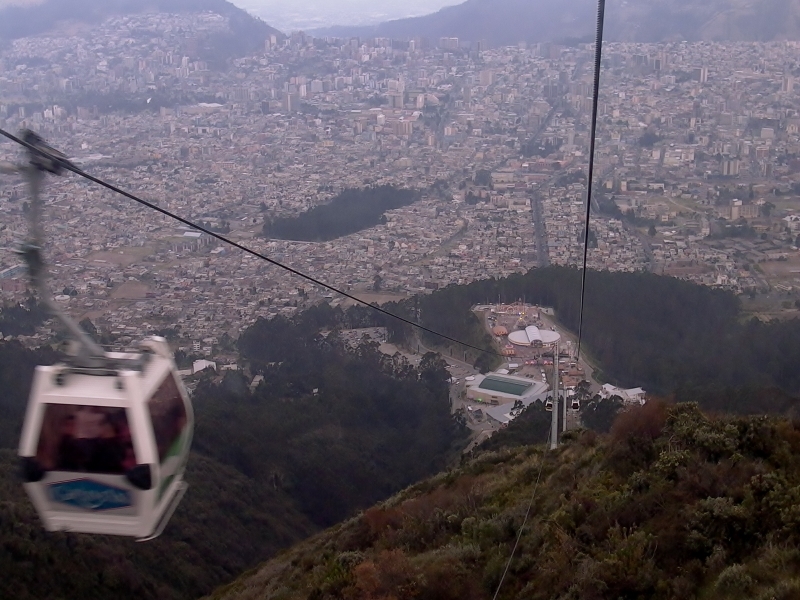 The inhabitants of Quito are called Quiteñas and Quiteños. R like… Rafael Correa. This is the current President of Ecuador (elected in 2007, re-elected in 2013). S like… San Francisco de Quito, the official name of the city of Quito, whose metropolitan area is the residence of over 2 million inhabitants. T like… Tri(color). “La Tri”, or “La Tricolor”, is the nickname of the national football team. U like… UNESCO, 1978. The colonial architecture of the city of Quito is part of the UNESCO World Heritage List. V like… Volcanoes, Avenue of the-. The Avenue of the Volcanoes goes roughly from Cotopaxi to Chimborazo. W like… Wagons. 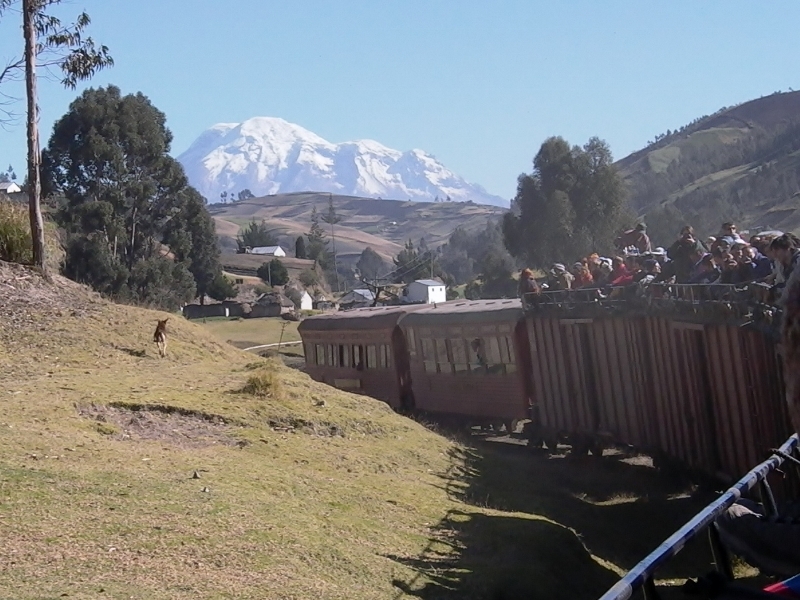 The train that goes from Riobamba to Nariz del Diablo (Devil’s Nose) is unique in that the passengers are seated on the roofs of the wagons and not inside of them, in order to admire the beautiful Andean landscapes. X like… CotopaXi, 5897 m, the second highest volcano in the country after the Chimborazo. Y like… CaYambe, 5790 m, the third highest volcano in the country after the Chimborazo and Cotopaxi. Z like… Zero. Zero degrees of latitude, the latitude of the equator and of Ecuador. Do you have some tips for people planning a long stay in Quito and its region?